Most of us as children at some point or another, will have with lights out, lay in the darkness listening carefully, for sounds of the monster under the bed stirring. This terrible creature of nightmares lurks silently, biding its time, watching and waiting for the right time to strike, from deep within its lair, directly beneath you. This notorious child-hood Demon is known to wait patiently for books to be closed and for televisions to be turned off, for whispered "Good-Nights" and the switching off of lights, and the closing of doors. Not to be confused with the monster in the closet, which is an entirely different beast, the monster under the bed lies waiting, until eyes close. And then the monster under the bed creeps out. But who is the monster under the bed? Nobody knows for sure, because none who have been unlucky enough to come face to face with this hideous entity have remained in this world to tell the tale, dragged as they were back into this creatures world kicking and screaming, to spend their remaining days trapped beneath the bed. Perhaps the monster under the bed is 'Owlman' a flying humanoid that has been known to terrorize the South-West of England, a fierce looking owl-like beast with huge fiery eyes that swoops down to attack locals along the Cornish coasts. But what would Owlman be doing under the bed? Perhaps the monster under the bed is a 'Leprechaun', angry at you for stealing his pot of gold in another life, and following through on a sworn oath to inflict his revenge upon you in this one. Perhaps Demons lie in wait for you, malevolent spirits who desire only to corrupt the souls of man, and inflict their appalling desires upon your being. Or perhaps in an example of high-strangeness a Kraken lurks, huge beak and tentacles, breaking free from the watery depths to ensnare your sleeping body, and as you struggle with eyes wide and wild, it hauls you down behind it. I almost caught the monster under the bed once, but my trap was flawed, and the monster broke free, but perhaps you will not be so unlucky in your attempts. Building a monster under the bed trap is easy, and can be made using nothing more than a large cardboard box, a stick, and some bait. To make the monster trap itself simply position the large cardboard box open top down with the stick propping up one end slightly from the floor, leaving enough room for the monster to crawl in. 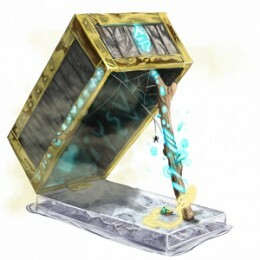 It is the bait used within the monster trap itself that is the most important aspect, and should be as enticing as possible in order for your monster trap to work successfully. I recommend dressing a pillow or doll in well worn pajamas, like a fishing lure the idea is to make bait that simulates as closely as possible the predators prey, i.e. 'you'. A well disguised pillow or doll can make excellent bait, and the pajamas should have been pre-worn, as it is a well known fact that all monsters under beds hunt primarily by scent, due to the dark lairs in which they live. The monster under the bed will after lights out be unable to resist this tasty looking morsel, and slithering out will make a dash for your decoy, knocking loose the stick supporting the box upright, bringing your monster trap crashing down upon it, enslaving the beast. Should your monster trap fail then there are other methods you can use to keep the monster under the bed at bay. Sage - Used by native American Indians to banish negative entities sage is a small evergreen shrub with greyish leaves and purplish flowers. A bough of sage in the form of a 'Smudge-stick' can be stored beneath the bed, thus preventing the monster under the bed from rising up from its domain. Silver - Used by the Chinese to keep Demons at bay, silver, usually in the form of a small silver locket can be placed underneath your bed in order to keep the Demons away. Numerous religions and cultures have believed silver to have the power to ward of evil spirits, and protect the wearer from their harms. The Incas believed silver to be the tears of the moon, and its thought that silver is attributed with these powers due to its reflective properties, silver catches the light, and repels the darkness. The Saint Benedict Medal - As a weapon of spiritual warfare the Saint Benedict medal (also known as ‘the cross of eternal salvation’) can make an excellent deterrent of monsters under the bed. Depending upon your religious beliefs the Saint Benedict medal is worn or used in order to call down God’s blessing and protection upon the wearer or user. Futons - And perhaps the best tool in your aresenal of weapons against those that prowl beneath the bed is the humble futon (or a mattress on the floor). Because how can a monster hide beneath the bed, if there is no beneath the bed within which to hide. I use to get scared from this same sort of thing when I was a kid. Every time I'd check underneath my bed, I'd swear that the monster would move away just as soon as I did and then would reappear once I looked away! My mattress is, to this day, on the floor. Mostly cuz beds are expensive, but still, Im more comfortabe knowing nothing can get under there. What would you do if you caught one? Shrink it's head? dissect it? feed it cookies? My son has a Futon, I did not know that was why the monsters went away! Of course now he is a monster, but we take what we can get. Pne of the best but most surreal and bizarre posts I've ready so far. Enjoyable. I LOVE this post! As a child I was convinced that if I stayed perfectly still the monster under the bed couldn't see me...like a Tyrannosaurus or something. I wonder where I got that idea. Pfft. Traps and beds on the floor. Beast can get under any bed,including those on the floor or ground. I'll see y'all tonight. Beast never go completly away. We're always around. Waiting. Things that are supposed to make us go away do NOT work. Try as you may. So,when the lights go out and you're in your bed,one of us will be there. Sleep tight. I just watched the movie, Little Monsters with my son. The movie has to do with monsters that come out from under your bed and scare children. My son knows that movies are made using actors in costumes. I also smudge my home at least once a week using sage. Is Buddha a God, a Man, or Something Inbetween?